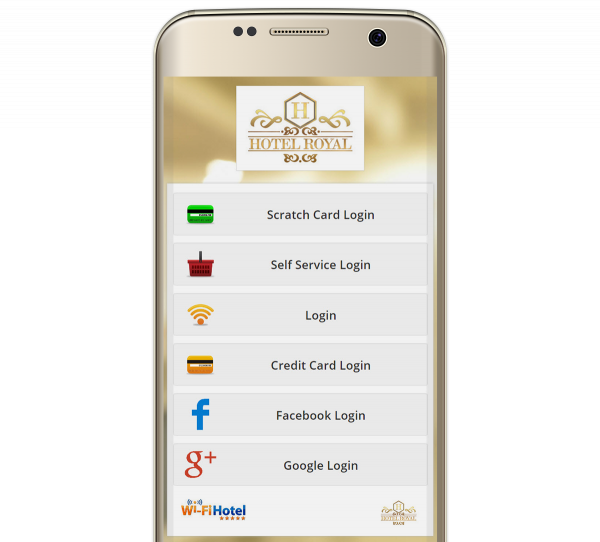 Wi-Fi Hotel is the most advanced software platform for managing Wi-Fi access and running marketing campaings for hotels and public spaces in the hospitality industry. Guests demand increasingly fast and efficient Wi-Fi. Offer them the best service they have ever tried, get a return on your investments and profit from the service. Discover the powerful features of the platform. 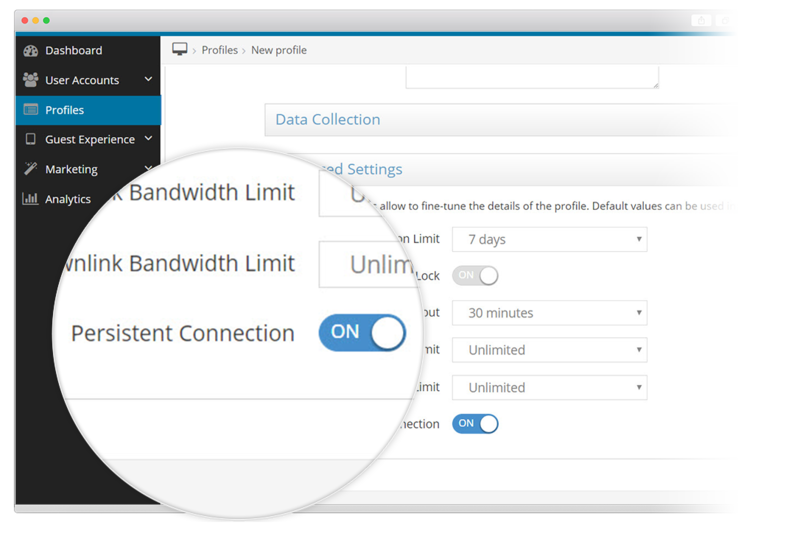 Take control of your Wi-Fi: manage access policies and optimize the use of Internet bandwidth. Define access profiles for your guests and create different levels of service for different types of users. Ensure the security of your network, for both your guests and yourself. 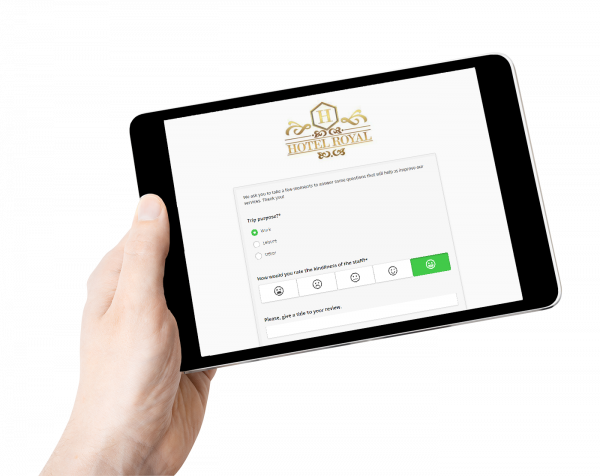 Manage in complete autonomy the way your guests will be accessing the Internet in your property, providing different profiles available to them based on their needs and yours. Multiple authentication methods can be activated simultaneously, allowing you to implement any Internet access policy you have in mind. Let your guests acces the Internet the way they would do it at home, thanks to persistent connections. After the first authentication, they can stay constantly connected without having to re-enter passwords or codes each time they get the their smartphones out of their pockets or turn their tablets on after a period of inactivity. The system recognises the devices that your guests have already uses, allowing them to stay always connected. Easy, instant and convenient access: just like home Wi-Fi. Guarantee your users the best navigation experience and protect your guests from malware and viruses. Prevent them from seeing inappropriate content, thanks to the content filtering functions and integrated applications in Wi-Fi Hotel. With content and application filtering, you can take thorough control of your network, choosing specific content categories and applications to make available to the guests who access the Internet using the Wi-Fi network of your facility. The analytics tools of Wi-Fi Hotel allow you to monitor and analyse system use with an unequalled level of detail. With our analytics functionality, you can find out which categories of guests use the Wi-Fi of your facility the most, at which times and which access methods they prefer. And, in particular, you can see how much traffic they generate, in order to prevent any congestion. Your Wi-Fi network can become the most powerful digital connection between you and your guests. Put it at your service and make it into a complete tool for automated marketing: to communicate, promote and enhance the on-line reputation of your facility. 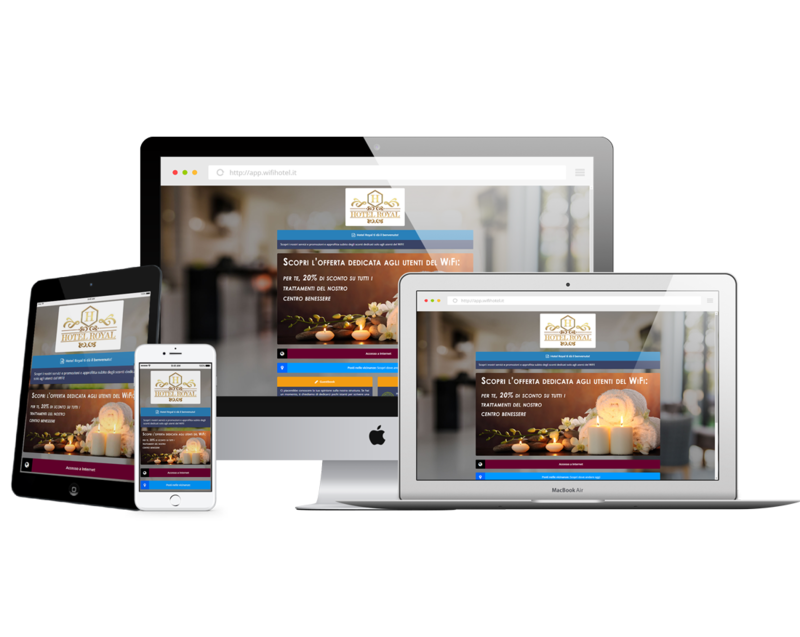 Completely customise your Wi-Fi system with your brand and welcome your guests with a wonderful, responsive graphical interface. 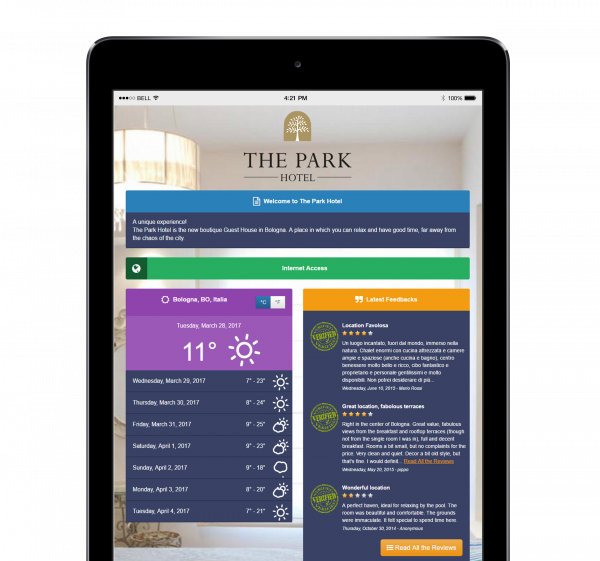 Independently customise it with the Guest Portal composer and use widgets to show your guests information on your facility, events in the area or points of interest. Also, make the news from their country automatically available, along with local weather forecasts. These days, many hospitality facilities have their guests’ data distributed over different systems or collected with antiquated methods, or they may simply not be available. Wi-Fi Hotel allows you to collect all the data on the users who connected to your Wi-Fi, with any authentication method, in full compliance with privacy and security laws. 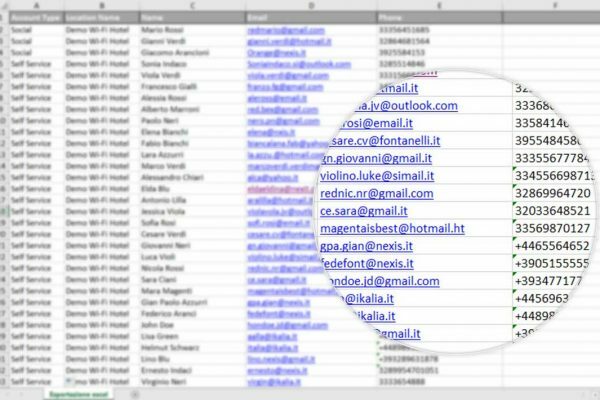 The most complete database of those who stayed in your facility, which you can export whenever you want or integrate in real time with the most common external systems. Today, as you know, guest opinions matter a great deal. Both from the perspective of always offering the best services and that of maximising your facility’s reputation on the web and on sites like TripAdvisor. Wi-Fi Hotel allows you to automatically send your guests, either during their stay or afterwards, different kinds of multi-lingual questionnaires and surveys, completely customisable, designed to head off any malcontents and resolve any problems while the guest is still at your facility, or to invite them to review your hotel on TripAdvisor or other review portals. All done automatically, with no need for action by your facility. This is true hospitality marketing automation. Social Wi-Fi doesn’t mean just guest access to social networks and data collection: it also means chances to do promotion, communications and marketing for your facility, especially on Facebook. 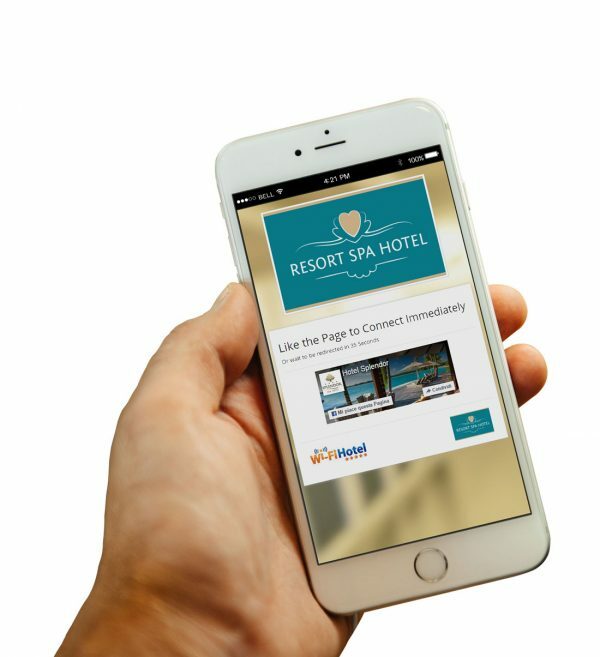 Wi-Fi Hotel’s powerful social media integration allows you to get guests’ ‘likes’ on your page, to take advantage of viral ‘social sharing’ every time they log in and to publish the best reviews you get with two clicks through Wi-Fi. And there’s more: you can also use your guests as targets for your advertisements on Facebook. 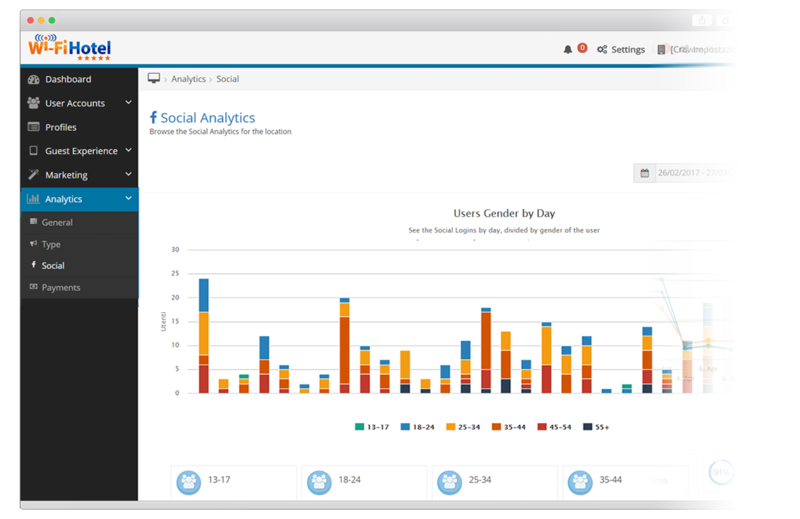 The simplest and most effective solution to increase the visibility of your facility on social networks. 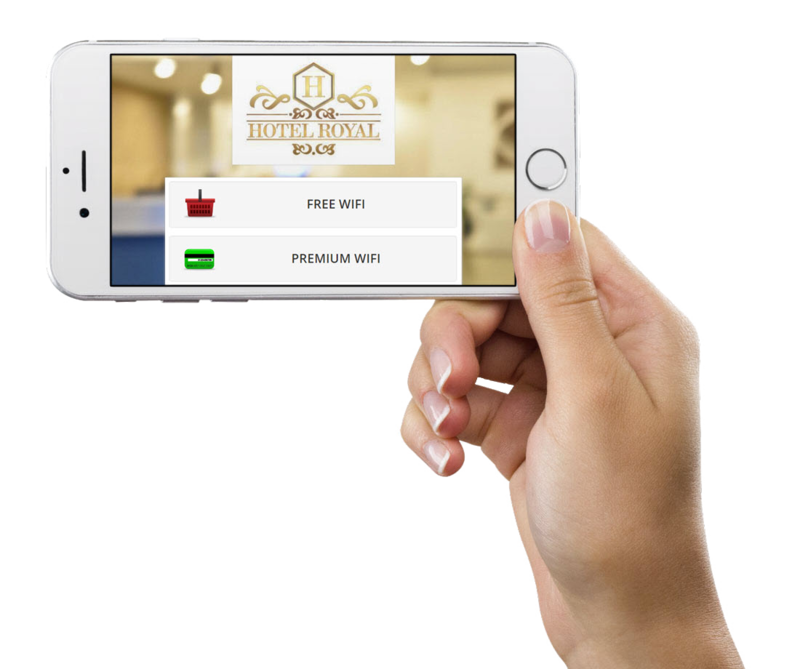 Wi-Fi Hotel allows you to return to earning money directly with Wi-Fi, allowing you to repay yourself for the investments needed to keep up with customer demands and changing the wireless network of your facility into a rich opportunity for business. Guests are not all alike: some are all Facebook and smart-phones, others work over the Internet and those with Wi-Fi want to watch TV the way they do at home. So why treat them all the same? With Wi-Fi Hotel, you can offer your guests different profiles with different features, for example, a free plan with bandwidth limits and applications for those who don’t have specific needs, and paid plans for more demanding users, without limits on traffic, time and applications. For the best management of your resources, getting a return on your investment and having satisfied users. Interacting with guests during and after their stay at your facility, automatically, based on specific events, with the ability to communicate anything. Dream or reality? Now it’s a reality: with Wi-Fi Hotel’s automated marketing functions, you can communicate with guests, ask them for feedback or suggest products and services, always at the right time, automatically. 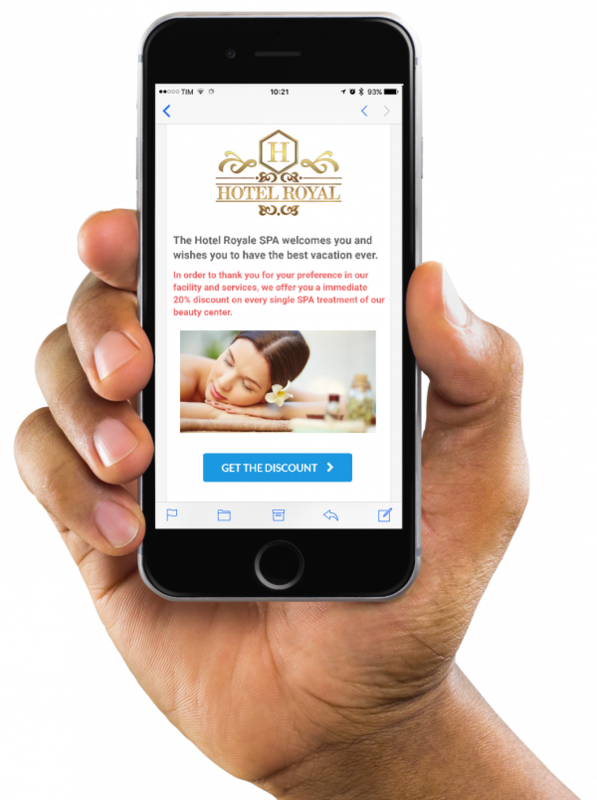 Imagine being able to welcome your guests with an SMS, ask them by email how their check-in went, offer a only-for-women promotion for accessing the spa of your hotel or send a post-holiday survey aimed at getting positive reviews on portals. It is all easy and automatic. This, along with your imagination, is Wi-Fi Hotel. Using the Guest Portal, offer your guests a complete, pre-populated search engine that contains the businesses and attractions near your facility. Enhance your list of activities with businesses that make an agreement with you and promote them on your system to increase your promotional revenue. Publish your banners, promotions and customised advertising content on the web and make sure your guests see them, which is useful for promoting your services and special deals, or those offered by your business partners. A promotional vehicle and an interesting possibility for direct monetisation. Integrate your management of your guests’ Wi-Fi access with your Property Management System or other management software. Operating efficiency at the highest level. Protect yourself from any illegal acts your clients may commit using your facility’s connection. Manage your system easily and intuitively, thanks to a flat design interface designed on the basis of careful study and feedback from thousands of customers. Grant access through the same user group accounts with multiple devices, simplifying Internet access and making it very fast. See Wi-Fi Hotel in action and discover how to make money and promote your facility by offering first-rate Wi-Fi. Request a Wi-Fi Hotel Demo Now!